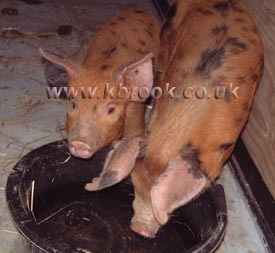 We have breeding stock and weaners for sale! Please call for details. I have wanted Oxford Sandy and Black pigs for many years and finally (in the year of the pig) my husband gave in well he had to really it was either pigs or elephants! The Oxford Sandy & Black is noted for its many qualities, particularly its excellent temperament and mothering abilities. The Oxford Sandy & Black Pig will function well under most management systems, and produces meat of very high quality and flavour (the markings do not go through to the meat). When crossed with white breeds pure Oxford Sandy & Black pigs produce highly commercial white hybrids. There can be no more visually attractive breed, with its excellent nature and ease of management making it a great favourite with the first time smallholder wishing to own thier first pig. Whoever has kept the Oxford Sandy & Black Pig will never be disappointed. 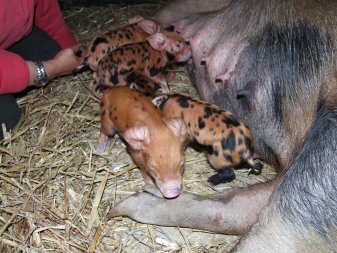 As well as being called the Oxford Sandy & Black Pig they are also called the forest pig and my favourite, the plum pudding! The Oxford Sandy & Black or OSB has reached crisis point at least twice in it?s history when numbers dropped so low that extinction was a real possibility. Unfortunately it had no Society or herd book to look after it?s wellbeing. As long ago as the 1940?s boar licensing had dropped to one or two a year for OSB?s but for a few dedicated breeders the breed would surely have been lost. 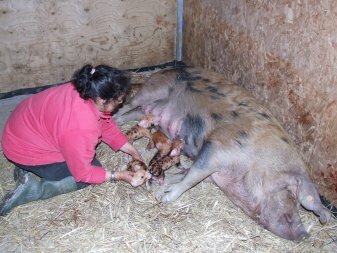 In 1973 the Rare Breeds Survival Trust was formed giving hope for the breed, but the Trust decided not to recognise the OSB. Once again the dedicated breeders were on their own. The decline continued to the brink of extinction when in 1985 the current Breed Society was formed. The current picture is very encouraging with the rarest bloodlines hanging on and slowly increasing. Hopefully the Breed is at last safe (although still relatively few in number) Recognition by, and transfer of herd book management to the BPA from the Oxford Sandy and Black Society has already brought increased publicity and opportunity to compete in recognised shows. The breed has many good qualities, particularly it?s excellent temperament and mothering abilities. Prolific and hardy it is particularly suited to outdoor systems, being good foragers and as they are a coloured pig with a good coat they are far less prone to sunburn. Breed conformation requires the base colour to be a light sandy to rust with random black blotches (not spots) with a white blaze, feet and tassel. A medium to large pig with good length and a deep body, good quarters and fine shoulders, strong legs and feet and well set on, giving a free and active gait. A moderately strong head, straight or slightly dished with lop or semi lop ears. As I write this, the Girls are in pig again and so I look forward to another farrowing. The Oxford Sandy & Black Pig is an excellent mother looking out for her young at all times and when about to lie down lets out a bark to alert the young to move. I am able to sit with them when farrowing and assist in anyway I can. I help them to clean their piglets then placing them under a heatlamp, which incidentally I keep on for three weeks day and night I have found by doing this after the piglets have fed from the sow they tend to go back under the heatlamp also with the light being on everybody can see where everybody is thus reducing the possibility of any piglets being accidentally crushed. Now and again I like to give my girls a good going over which includes cleaning their ears, cutting their nails and checking in the mouths. All this I am able to do whilst they lie on the floor and have their tummy tickled yes I know I sound very trusting but I am on my guard at all times as a pig that weighs in excess of 160kg is to be respected. Those of you interested in the quality of the meat the Oxford Sandy & Black is lighter boned than many other breeds, so produces a good ratio of meat to bone when slaughtered. It is also less inclined to put on excess fat than some breeds, making it helpful to people new to pig keeping. Being a member of the Oxford Sandy & Black Pig Society and the British Pig Association I am now able to keep up-to-date with what?s going on and where. We enter Henrietta into the local agricultural shows we attend both the Devon County Show and the Royal Cornwall Agricultural Show. Please feel free to contact me if you are interested in the Oxford Sandy & Black pig and would like to own this wonderful breed.